I went to Japan this month. Quick trip. In one day, ride one day, out the next. So rushed that the only sushi I had was at the airport before I boarded my flight back home. So rushed that neither the usual motorcycle shop in Ueno nor the other one near Shinanome could be visited. So rushed that I never even went for a walk. But in that schedule was an amazing meeting. But before I go there, let me tell you about the last time I went to Japan. We were there to ride the Suzuki Gixxer SF and obviously, it rained. But one day we stopped at a highway rest stop on a touristic adventure which happened to have a Kushitani store. Kushitani - look it up - makes premium motorcycle gear - lovely stuff, credit-card-incineratingly expensive. Outside the store stood a black BMW motorcycle that I had a lot of trouble understanding. I still don't get it. The all-encompassing black panels with their old-school double stripe pinstriping were very disconcerting. It was sort of a cafe racer, but was it one by the traditional yardsticks? Unhelpfully, the card next to the bike said, "Cherry's Company". Which, in Japan, could mean anything. You know, like Mazda's cars were supposed to make you Zoom Zoom. Soon after I returned, I forgot all about the bike and that, it appeared, was that. This time, Harley-Davidson organised for us to spend the morning at a place called, you guessed it, Cherry's Company. I never made the connection. The itinerary said, "Harley-Davidson customiser Cherry's Company" and the hour long bus ride to the place left me in a sort of bored stupor. Kaichiroh Kurosu is the lead man at the outfit. He's a reasonably young Japanese lad with a head full of curly hair, a loosely styled modern 'goateee' of a beard and a worn company tee and threadbare denims. Kurosu took up station next to a bare gold coloured Harley frame on a workbench as we sat obediently in folding chairs wondering what life-changing knowledge we were going to gain today. Most were convinced that this was just a way for Harley to get us out of the way so the other group could ride the 2016 bikes until it was our turn to ride post lunch. But once Kurosu San started talking, I snapped right of my cynical stupor. Evidently, the reason why Kurosu and Cherry's are considered so important in that inscrutable world of customs is because his bikes don't fit. Conventional classifications and expectations, that is. I made the connections later once I received a postcard bearing Kurosu's bio and that odd BMW from the Kushitani store. This furniture designer who's been an H-D mechanic and now builds seriously expensive customs said simply that he hadn't always thought of his designs as mould-breaking by intention or tradition. It's something that happened along the way and something he'd begun to enjoy enough to consciously incorporate in his most recent work. It's an identity thing now. How many people is the Company? Four, he says. But they do everything here. They've lathes in the back, access to CNC machines and stuff. "But I prefer to make most things by hand. You know, old school. Only sometimes, when the design has a modern edge I may get it laser cut or something." That is interesting too. Hand formed metal takes time. "Three months. I have a fixed three month schedule to finish custom bikes." I then asked him what bikes he's seen recently that he didn't feel the need to mod at all. Where a manufacturer's vision is so refined that those like him could just bask in their work rather than worry over what all needs to be improved. 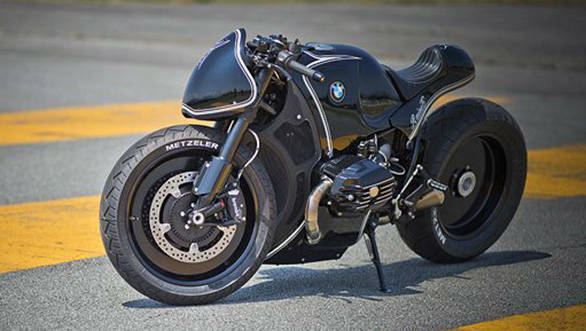 Without any hesitation, he said, "BMW RnineT." Which is interesting because, as it turns out, that's the bike that was underneath that Kushitani store oddity. At this point, naturally, I was beginning to worry that the usual loss of fidelity was stultifying the conversation. There is no way a casually selected interpreter can deliver in English the nuance of Kurosu San's responses in Japanese. His hands linger over metal as he carefully, thoughtfully, smoothly answers questions. What had I missed? How is making motorcycles different from making them for mass consumption? He smiles, "It's one bike for one person. I sit with them to understand what they want and then gently guide them in directions I think will satisfy them." The mass manufacturers can never hope to reach that level of personalisation. Why Cherry's Company? He says, "Cherry is a Japanese word for a rookie. Someone who has a lot to learn. Company is about people I hang out with. Hence the name. A group of people who're good company and have a lot to learn." I boarded the bus to the lunch stop - where our bikes were - head abuzz. Being able to quiz a master customiser on his creative process is a very interesting sensation. But what remained with me was the name. It's never about what we know. It's always about what we've left to learn.